As the leading nation of origin for U.S. unauthorized immigrants, Mexico exerts the greatest influence on trends for the overall population, but other nations play a role too. 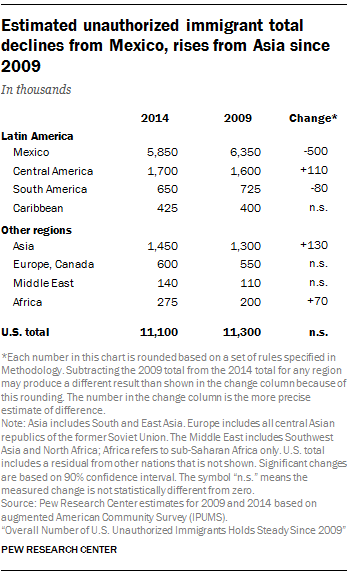 From 2009 to 2014, a decline in Mexican unauthorized immigrants was mostly balanced by an increase in the number from the rest of the world, especially from Asian, Central American and sub-Saharan African nations. The number of unauthorized immigrants from Mexico in the U.S. peaked in 2007 at 6.9 million and has declined since then, to 5.8 million in 2014. 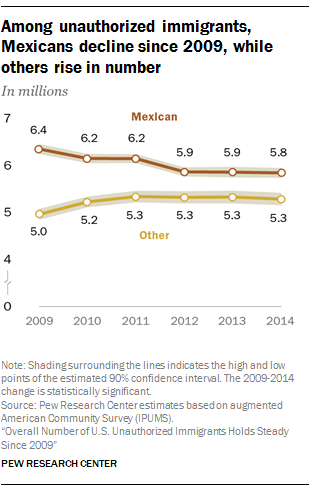 Mexico accounted for 52% of unauthorized immigrants in 2014, but that is down from 57% in 2007. Pew Research Center analysis of Mexican and U.S. government data indicates that from 2009 to 2014, more Mexican immigrants and their families left the U.S. for Mexico than came to the U.S. from Mexico. During this time period, about 1 million Mexicans (lawful and unauthorized) and their families (including U.S.-born children) left the U.S. for Mexico, according to data from the 2014 Mexican National Survey of Demographic Dynamics (ENADID). U.S. Census Bureau data for the same period show an estimated 870,000 Mexican nationals left Mexico to come to the U.S. In addition, U.S. Border Patrol data show a sharp decline in apprehensions of Mexican migrants in recent years. Those apprehensions, which are an indicator of flows, declined to levels not seen in 45 years for the fiscal year that began Oct. 1, 2014. The Great Recession of 2007-2009 reduced employment in construction and other sectors where Mexican immigrants overall are especially likely to work. Border enforcement has ramped up, as can be seen in increasing numbers of Border Patrol agents. There also has been a growth in deportations, which totaled 2.4 million from fiscal 2009 to 2014. Long-term demographic changes in Mexico mean that a smaller share of today’s Mexicans are ages 15 to 29, an age span in which people are more likely to migrate. After those from Mexico, the second-largest number of unauthorized immigrants in 2014 were from Central America, totaling 1.7 million, or 15% of the unauthorized immigrant population. Their numbers rose slightly from 1.6 million, or 14% of the total, in 2009. The rise in Central American unauthorized immigrants is borne out by data from the U.S.-Mexico border. According to U.S. Border Patrol statistics, the number of apprehensions of people from nations other than Mexico rose sharply in 2014, to 257,000, and for the first time it surpassed the number from Mexico. They included thousands of unaccompanied children from Central America, many of whom were fleeing poverty and violence, according to the Department of Homeland Security. Asia, encompassing South Asian nations such as India as well as East Asian countries including China, was the birthplace of 1.4 million U.S. unauthorized immigrants, or 13% of the total in 2014. In 2009, the population of unauthorized immigrants from Asia was 1.3 million, and 12% of the total. The number of unauthorized immigrants from sub-Saharan Africa ticked up, to 275,000 in 2014 from 200,000 in 2009. The number of unauthorized immigrants born in South America was about 650,000 in 2014, down from an estimated 725,000 in 2009. The 2014 population of U.S. unauthorized immigrants from the Caribbean (425,000) as well as Europe and Canada (600,000) remained steady since 2009. The total from Middle East nations (including North Africa), an estimated 140,000, did not change. Unauthorized immigrants from the Middle East accounted for about 1% of the total, a share that has not changed in a decade. Although as a group, unauthorized immigrants are 26% of the U.S. foreign-born population, the share varies by origin. About half of Mexican immigrants (48%) and Central American immigrants (50%) are unauthorized, according to Pew Research Center estimates. Among South Americans, an estimated 22% are unauthorized. The shares are somewhat lower for immigrants from the Caribbean (10% of whom are unauthorized); Asia (13%); Europe and Canada (10%); and all others (13%). 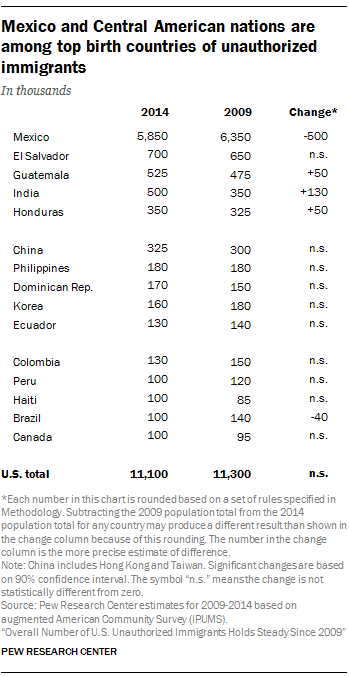 Although Mexico is the nation of origin for by far the most unauthorized immigrants in the U.S., three neighboring Central American countries – El Salvador (700,000 in 2014), Guatemala (525,000) and Honduras (350,000) – also are among the top five. About 300,000 unauthorized immigrants who are from El Salvador, Haiti and Honduras live in the U.S. with a status protecting them from being deported, due to continuing impacts from natural disasters in their birth countries that might prevent them from returning home. An estimated 195,000 Salvadorans have Temporary Protected Status that shields them from deportation, due to a series of earthquakes in their home country in 2001. About 50,000 Haitians have Temporary Protected Status because of the continuing impact of the magnitude 7.0 earthquake that occurred in 2010. And an estimated 57,000 Hondurans have Temporary Protected Status due to continuing problems stemming from a hurricane in 1998. Several nations that are among the largest sources of unauthorized immigrants are also among the largest for lawful U.S. immigrants. These include not only Mexico, but India, birth country to an estimated 500,000 unauthorized immigrants in 2014, as well as China (325,000) and the Philippines (180,000); these were the top four sources of new lawful permanent residents in 2014. Earlier this year, the Department of Homeland Security released its first partial estimate of the number of those who overstay their permits to be in the U.S. There is some overlap between the government’s estimate of the top birth countries of people who overstayed their visas and the Pew Research Center estimate of the top birth countries for all unauthorized immigrants. Among the nations appearing on both lists (listed in descending order of the Pew Research Center estimates of the unauthorized immigrant population) are Mexico, India, China, Colombia, Brazil and Canada. Canada ranked first in the government’s report on overstays, accounting for about 93,000 visitors whose visas expired in fiscal 2015, which ended Oct. 1, 2015 (so covers a different time period than the Pew Research Center estimate for calendar 2014). According to the Pew Research Center estimates, about 100,000 unauthorized immigrants from Canada lived in the U.S. in 2014. The top countries of birth for unauthorized immigrants have been remarkably stable for at least a decade. The top six countries in 2014 were the same ones that have been among the top six since 2005 – Mexico, El Salvador, Guatemala, India, Honduras and China. The remaining nations in the top 15 in 2014 – Philippines, Dominican Republic, Korea, Ecuador, Columbia, Peru, Haiti, Brazil and Canada – have all been in the top 20 for the past decade. Among the top 15 countries of birth, the number of unauthorized immigrants declined for two and rose for three over the 2009-2014 period. As noted previously, the number from Mexico declined since 2009. There also was a decrease, of about 40,000, in the number of unauthorized immigrants from Brazil from 2009 to 2014. Three of the top 15 birth countries had statistically significant increases in their populations of unauthorized immigrants living in the U.S. They include Guatemala and Honduras, each with an increase of about 50,000, and India, with an increase of about 130,000. The population of unauthorized immigrants from each of these three nations also grew from 2007, the first year of the Great Recession, to 2014.